Twitter is a terrific tool to catapult your excellent blog content of millions of eyeballs. The trick, therefore, is to make your content as easy as possible to share and tweet. The easier you make it, the more your visitors will do it. In effect, your content accumulates more tweets, likes and shares and your Twitter traffic increases rapidly. So the question is, how to make people tweet and share your posts and articles? And how to make it as easy as possible for your visitors? And then, how to control what they share and tweet? Sprinkle plenty of Tweet This buttons (and links) over all your content. Turn your most awesome thoughts and sentences into pre-prepared tweets. Then encourage people to tweet them. Well that’s what I’m going to show you now. In fact, there are different ways to accomplish it. You can use WordPress plugins or do it without plugins. It’s up to you. Just keep reading and I will show you both ways. Should You Use a WordPress Plugin? Using a plugin to do the job is one of the easiest ways to solve such problems. 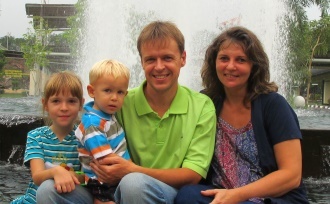 The only trouble is that the more plugins you install, the more you burden your site. Eventually, your site speed may suffer, and Google may punish you with lower rankings. Note! To be honest, when the plugins (the code) are written well they don’t make your site slower. The big trouble, though, is that the market is flooded with poorly written plugins. And THESE are the ones that can make your site as slow as a tortoise. If you can quickly and easily work your way around the problem without using an additional plugin, do it. If it’s too difficult to achieve without a plugin, use a plugin. In this post, I am going to give you both solutions – How to add ‘Tweet This’ button by using a plugin. And how to add ‘Tweet This’ without a plugin. Click on the ‘Install Now‘ button and then ‘Activate‘. That’s it. The plugin is up and running. On the left-hand side, click on the Settings section which will expand providing you additional options. Click on ‘Tweet This‘. In the ‘Settings‘ section you can choose how you want your tweet boxes to look like. Now, to help you go through the settings faster, let me tell you quickly what you will find here. Note! Determine settings for both – the Box mode and the Link mode. Later, while sprinkling ‘Tweet This‘ buttons into your articles, you can choose for each button whether you want to use a box mode or a link mode. As you see, I filled the ‘Default Twitter Handlers’ only. That’s because I wanted to add ‘via @egonsarv‘ to all outgoing tweets. The plugin offers five different ‘Tweet This’ box layouts. Pick whichever you like best. After finishing the customization hit the ‘Save Changes‘ button at the bottom of the page. Display mode – that’s the place where you choose whether you want the Tweet This button to appear as a box or a link. See! 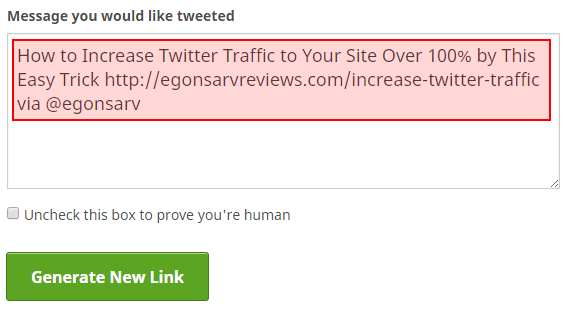 The plugin adds the URL of the article and theTwitter username automatically. After finishing with the tweet click on ‘Insert Shortcode’. If you choose the link mode, the code is similar. Wow! The Tweet This Box looks neat, doesn’t it? Plus, it’s also incredibly simple. Now I am going to show you how to add a Click to Tweet button without using a plugin. And yes, it’s quick and easy too. Well, how do I do it? Find some incredible and worthy-to-tweet thought (or sentence) in your article. Then find a place where you want to insert a new Click to Tweet link or button. Here’s the tricky part, though. Your actionable tip should be short enough to leave room for the URL and your Twitter handler. Also, if your URL is too long, it’s better to use some URL shortener. Now you can copy and paste that newly created link into your article. Use the link the same way you use every other link. Note! Make sure you make these links open in a new browser tab. When Visitors Click on the Click to Tweet Links? It should open a new official Twitter child window with a Tweet composer. I have seen it work that way. However, in my case, I could not make it work like that. Instead, clicking on the link above opens a brand new browser tab with the Tweet composer. Apparently, a new browser tab puts you at a disadvantage as it forces visitors away from your post. That’s why a small Twitter child window is way better. I tried hard to make it open in a child window but until now I don’t know why it does not work. Do you know how to solve it? Please leave me a comment into the comment section below. Note! In the code above, don’t forget to change the ‘data-via=…‘ line. 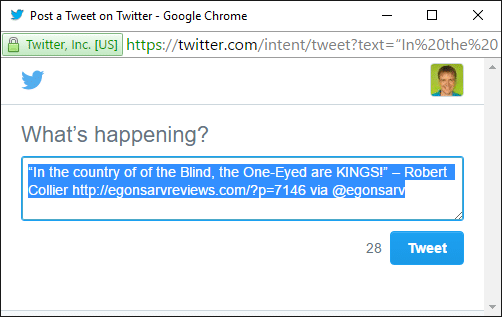 Replace my Twitter username ‘egonsarv‘ with yours (without the symbol ‘@’). To copy and paste the code just do the following. Navigate to Appearance → Editor. Then, on the right-hand side menu scroll down to find the ‘Theme Header’ (header.php). Click on it. Paste the code just above the closing </head> tag. Now you are ready to add official Tweet buttons to your posts. Note! These buttons Tweet a headline and URL of your article and your Twitter handler. You cannot change it. Therefore, it’s different from the Click-to-tweet method described above. Note! Do it using the WordPress text editor (not a visual editor). You can try it right now by tweeting using the button above. As you see from the post above, there are different ways to include Click to Tweet buttons to your posts. You can do it by using a plugin or simply adding a shortcode. I have found that the easiest and fastest way to do it is to use a plugin. Yes, I burden my site with another plugin (which is not so good), but it saves me tons of time. And that’s what counts. 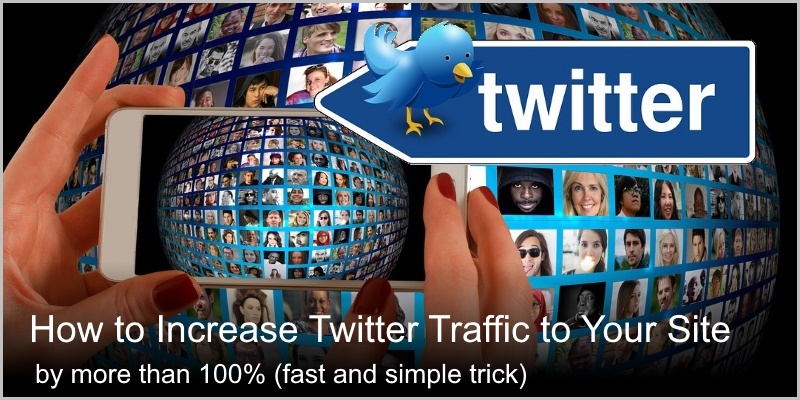 Now you how to increase Twitter traffic 100% and more. What other ways you know (and prefer) to sprinkle Tweet This buttons into your posts? Drop me a comment, please?